Paul Tesluk has been named the dean of UB’s School of Management after former dean stepped down from the position in April 2015. Paul Tesluk has been named the dean of UB’s School of Management after a lengthy international dean search. Tesluk has served as the interim dean of the School of Management since 2015. Former School of Management Dean Arjang A. Assad stepped down from the position in April 2015 to become the dean of University of Pittsburgh’s Katz Graduate School of Business and College of Business Administration. Charles F. Zukoski, UB provost and executive vice president for Academic Affairs, announced Friday that Tesluk had been appointed as the dean of UB’s School of Management. This university’s international search for dean was narrowed down to three candidates with Tesluk ultimately being selected. Zukoski said when Tesluk became interim dean, they discussed the possibility of appointing him to permanent dean status. He said although they had this discussion, there was no “forgone conclusion” that he would ultimately be appointed to the position. Tesluk has been a UB faculty member since 2011. He was a chair of the Department of Organization and Human Resources for two years. He also served as an academic director of the School of Management’s Center for Leadership and Organizational Effectiveness. Tesluk’s appointment will be made effective on April 25. “My first priority [as dean] is to build on the strong direction and momentum that we already have within the School of Management,” Tesluk said. Zukoski announced that the search for dean was underway in September 2015. Zukoski said the Search Committee, which is made up of UB faculty, staff, students and an individual from outside of the university, reviewed files of candidates that had been assembled. Ten to 20 candidates were selected from those files, he said. Those candidates each were given an “airport interview,” a confidential meeting between the candidates and the committee. After the search was narrowed down to three candidates, each of them came to UB’s campus to meet with faculty and staff. 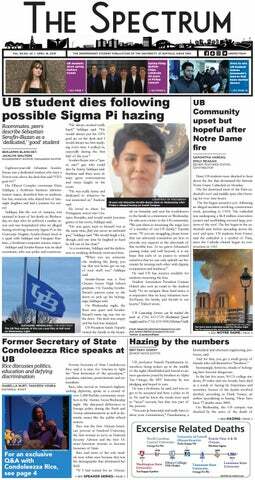 The committee then made candidate recommendations to Zukoski and UB President Satish Tripathi, who made the final decision. Tesluk said his role as interim dean allowed him to gain experience with working with UB faculty and professional staff. Zukoski said Tesluk will be a “tremendous asset” as the dean of the school of management. As dean, Tesluk said he would like to continue the growth of several programs within the School of Management. He said he looks to continue to grow the Honors Program and Learning and Community Center for undergraduates. He said he would also like to continue the School of Management’s collaborations with other schools across UB. He said 30 percent of the School of Management’s full-time students are dual degree students and he would like to encourage students to combine various academic disciplines. Tesluk said he would also like to strengthen students’ global experience. “UB has a very strong international student base and the School of Management has one of the highest international student populations, it’s important for students to learn about management from a global perspective,” Tesluk said. Ashley Inkumsah is a co-senior news editor and can be reached at ashley.inkumsah@ubspectrum.com.